Vientiane (VNA) – A delegation of the Vietnamese embassy in Lao led by Ambassador Nguyen Ba Hung on April 5 visited the office of the Lao Foreign Ministry in Vientiane to extend greetings on the occasion of Bun Pi May, the traditional New Year of Laos, which will fall on April 14-16. On behalf of the Vietnamese Government, Ambassador Hung expressed best wishes to Lao Foreign Minister Saleumxay Kommaith and handed him the New Year greetings letter from Deputy Prime Minister and Foreign Minister Pham Binh Minh. The diplomat availed himself of the occasion to thank the Lao minister and his staff for their constant support, help and facilitation for the Vietnamese embassy to accomplish its tasks. 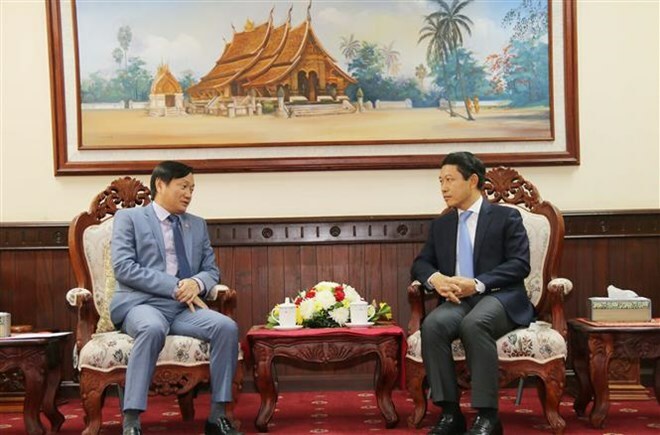 He said he is glad to see the practical fruits of the special Vietnam – Laos relations, and affirmed that Vietnam is actively realising bilateral high-level agreements. For his part, the Lao minister thanked the Vietnamese diplomat and asked him to convey his gratitude to Deputy Prime Minister and Foreign Minister Pham Binh Minh for sending the letter. This reflects the relations of brotherhood and comradeship between the two ministries in particular and the two countries in general, the minister stressed.